This antique children's transferware plate dates to 1890. The plate measure about 5 1/4" in diameter and were originally part of a complete toy tea service. The color is a rich red. The plate was made by Charles Allerton & Sons, a pottery manufacturer in the Staffordshire region of England who was well known for his whimsical children's tea sets. The influence of the Aesthetic movement on the pattern designs captures the Victorian love of nature and the exotic. The plate depicts young Little Mae sitting on a stoop in a doorway with a kitten on her lap, a cat drinking milk from a bowl, a dog sitting beside her and a bird looking on from overhead. This endearing scene is framed by an aesthetic background of flowers, birds and lots of geometrical whimsies. The rims are decorated with a criss-cross border and fruit trim. The pattern is commonly associated with pattern number 780 and registration number 106741, registered to the Staffordshire pottery maker Charles Allerton in the last quarter of the 19th century. The plate is in great condition with no chips cracks or repairs. Normal stilt marks. Children's aesthetic transferware is hard to find and highly sought after, especially in this whimsical pattern. These little plates make a stunning collection, or add them to any existing collection of toys and children's ware. Little Mae patterns were made for the American and Americana market and are as charming today as they were when they were first sold. 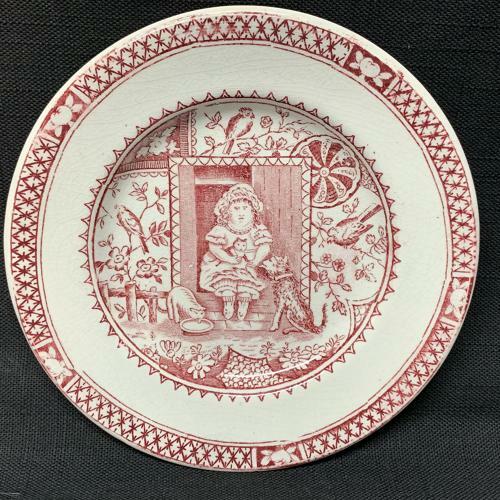 We have also listed companion plates depicting the same little girl carrying eggs in her apron, and with her arms around a big dog. We have much more in stock. Please let us know if you are looking for a special gift. We are always happy to combine shipping of multiple purchases.